To most Americans, Jim Broadbent is Harry Potter’s Professor Slughorn, or perhaps the goggle-eyed ringmaster from Moulin Rouge! While he’s most often exploited on this side of the pond for his ability to create larger-than-life figures, the roles Broadbent plays in his native Britain span a wider range. In Another Year, his fourth feature-length collaboration with Mike Leigh, Broadbent plays the idyllic mate to psychiatric counselor Ruth Sheen, whose genial good will is tested by the encroachment of their increasingly desperate friend Lesley Manville. Like all of Leigh’s films, it was built from the ground up, with the actors and director taking months to shape their characters and the film’s plot. While in New York to talk up the film, Broadbent spoke with The A.V. Club to reflect on his long history with Leigh, why he’d often rather play historical figures than fictional characters, and going to the limit in Moulin Rouge! The A.V. Club: You’ve worked with Mike Leigh a number of times. Has the experience changed at all for you? 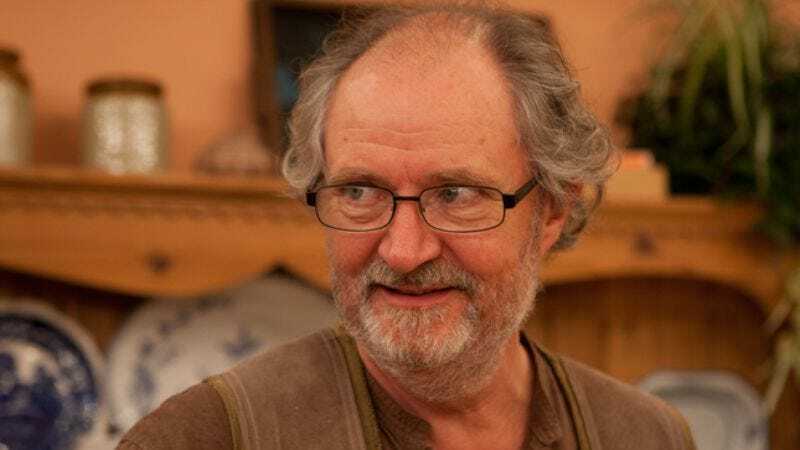 Jim Broadbent: The experience has changed over 30 years, because to start with I didn’t have a clue what was going to be going on, how he was going to work, and what sort of man he was. [Laughs.] That was every day going to the edge of the cliff and wondering, “What on Earth do we do next?” In many ways that was the process. It was the overriding and exciting thing about the very first thing I did with him. The process hasn’t changed, but it is something I take in stride completely because it’s something I’ve done so often. In fact, the process is now not particularly interesting. It’s very hard work. It’s very time-consuming. It takes a long time; it takes as long as it takes, and it is absolutely necessary that it does take that long. That’s not the enjoyable part of it. The enjoyable part is developing a fully rounded and nuanced character and getting the chance to play that, which is a unique experience. The amount of time it takes is frustrating to some extent, but that pays off hugely in the long run. All the jobs I’ve done with him I’ve been very pleased with and proud of to some extent. So when I got the opportunity to do this one, even though I think, “Well that’s going to be eight months. Do I want to commit myself to something and I don’t know what the character is going to be, who the part is going to be, or who I’m going to be working with, or who I’m going to be having relationships with?” So it’s an act of trust to take it on. JB: He’s obviously got such a reputation now that I think a lot of people are willing to take that chance. AVC: How was it different working with Leigh on this short film, which you wrote yourself? JB: That was a unique one. In a way it was brilliant, because I wrote it and rather than send him a script, or other people, I sent them a cassette tape of me, because it was a monologue, me reading the script in character. He got the tape and said let’s do it, and Channel 4 picked it up immediately. From me sending him the script to having it on the television was less than six months, which was really easy and incredibly satisfying. The way I had written it was, in many ways, according to strict Mike Leigh rules. I developed a character, albeit on my own, and got him talking, albeit to an imaginary camera, and did an awful lot of solitary improvising in character and whittled it down to a tight script. Even though it wasn’t a Mike Leigh-developed project, I think he recognized the character development, and it was something that he could empathize with and bring something to. AVC: Even though it’s not naturalistic, the whole thing comes from character. JB: Well in a way, it is naturalistic. I mean, friends of mine who know me and knew me then, turned it on and thought it was a documentary and turned it off. [Laughs.] They didn’t recognize me and thought it was rather a boring documentary of somebody wandering around his estate and being pompous about his inheritance. So I think it must have been to an extent a naturalistic piece, or a realistic piece, to fool people for some of the time anyway. AVC: It would be hard to get farther apart from your performance in Another Year than the high style of Baz Luhrmann’s Moulin Rouge!, where you’re dancing around and singing “Like A Virgin.” How do you measure how far to take a performance like that? JB: With Moulin Rouge, I had to take it as far as Baz Luhrmann could push me, which was a long way. That all comes from doing a lot of theater and doing some very big-caricature theater, broad comedy in big theaters. It’s a question of bringing that size of performance to the screen, which is totally appropriate for Moulin Rouge! I do always like to do things I haven’t done before, so I’m always looking out for things in a different genre, or a different sort of character. The script has to be appealing, and what appeals is often something that surprises me because I’ve never come across it before. AVC: Moulin Rouge! is almost like Fear And Loathing In Las Vegas, in that there’s this incredibly intense, even abrasive, opening sequence that lets up just at the point where it’s about to become unbearable. Or well past that point, for some people. JB: And it upset a lot of more traditional filmmakers—or not even traditional filmmakers, older filmmakers. I don’t think Mike liked it at all. I think the beginning, the very jerky, moving camera, a lot of people found that quite alienating as you say. But it was a man’s vision and that’s what, in some way, defines the jobs I really like doing—when the director has a strong vision, whether it’s Mike Leigh or Baz Luhrmann. JB: That was such a wonderful, brave, huge visionary piece. To have the idea that you can create that world, New York at that time, such a wild and strange melting pot—I thought it was a wonderful film. AVC: It’s a much less naturalistic approach to history than something like Topsy-Turvy. When you’re playing a historical personage of some repute, ill or otherwise, do you feel indebted to the real person? JB: If you’re playing any real person, live or dead, you certainly have a responsibility to produce that reputation in some way. Obviously Tweed wasn’t in great standing. [Laughs.] But you don’t want to parody or mock it so it doesn’t mean anything anymore. It’s a sort of responsible approach to trying to give an impression of a real person. It happens more and more that I play characters based on real people. But in the end, you’re making a fiction, and I’m playing a part, and I don’t look anything like the original guy, really. Whether it’s Iris Murdoch’s husband, John Bayley, or Lord Longford, any of these real people I’ve played, I try to get it as right as possible. It’s interesting playing these real people. Particularly latterly, when there’s documentary footage of them, you get a chance to get under their skin, and very often they give you the chance to play a more complex character, rather than a traditional fictional character who’s probably written with one or two main points to be made rather than the complications that come with a real person. AVC: Real people come to you with their contradictions intact. JB: And I love getting into all that. So in a way I try to do an impersonation, because that reveals the character to me, particularly vocally. But I don’t want it to look like an impersonation because that’s alienating if you think somebody is just doing an impersonation to try to get under the skin of it. AVC: In that case, will you start out with a more faithful interpretation and then back away from that as the character becomes more rounded? JB: Not consciously. Once I get the character going, I sit back, and that becomes who I think the character is, so I don’t keep going “Check.” So by the time we start filming, I won’t go back and look at the documentaries about Lord Longford to see how he spoke, because that would all have been established by then. AVC: Lord Longford was a British politician who was notorious for his campaign to get convicted murderer Myra Hindley out of jail. Was he still well known in the UK? JB: He was—and mocked. [Laughs.] A figure of fun. I think Peter Morgan’s initial idea in writing a film about Lord Longford was that he would like to hatchet-job this ridiculous man, rather in this similar way to what we have been describing. I said, “I’ll be excited to play it” and all that, and then he started writing it. I thought he’d forgotten it, really. But by the time the script came, it was very much more respectful of him, because once he researched him and found out the conflicts and the contradictions and how interesting he was in many different ways, it’s a case of a real character being more interesting than a fictional idea. So it’s getting that research and bringing it into play, which is rewarding. AVC: Is there a comparison to the way you make movies with Mike Leigh? In a way, you’re researching a character who doesn’t exist yet. JB: It gets closer to it. It is a purely invented character, but it’s closer to that, getting to a real person, because you have that amount of time to build up complicated relationships and backstories. In [Another Year], the relationship with Ronnie, the older brother, that was worked on very early in the stages of the five-month rehearsal period. That was all established and kept on a low burner throughout the process. So when they meet later on in the film, that’s all there in the background. By that time it becomes a real memory for the character. AVC: When you get to see Ronnie finally, he lives a much more dreary and impoverished life than Tom and Gerri. Did you have to come up with a sense of how that happened? How the two brothers diverged? JB: It happens in families. Tom was obviously academic, bright, and an achiever, and gregarious and had friends and was able to follow his dream and be the first in history to go to university. [Laughs.] His older brother wasn’t so bright, and did his national service and never really had a full-time job since. He was work-shy. They never had any falling-out, but they didn’t have much in common. I think as sometimes happens in life, the younger brother took a degree of responsibility for his older brothers, knowing that he was not going to be out there himself. It’s never decided that that will be the case. Mike is working on us individually, with the actors developing the characters. And the improvisations, those are the relationships that develop, and that is kept and sustained. But it’s never a decision on the actor’s part to have that sort of relationship, because it happens organically. You don’t get to make those decisions. Those decisions are made, but they are given by Mike from the choices that we present. You could go any way. But he knows where all the characters are being developed, on which lines. Where they will meet and where they will have conflict is somewhere in his mind, as it was. AVC: Mike Leigh has rebutted, sometimes quite fortunately, the idea that his movies have messages, which is true. But they do have strong spines, very clear themes. They may not have a definitive statement to make, which is just as well. JB: I think his thing is that it’s up to the audience to find themes they want. That will vary from audience member to audience member. AVC: How different was it doing Topsy-Turvy? You’re using Leigh’s method, but you’re playing a character who is already very well documented. JB: That was very different. I knew what I was going to be playing, and I knew when it was going to be set, where it was going to be set, and that the story basically would be set around the original production of The Mikado. We did a vast amount of research into what had really happened, all of us — the whole cast, the chorus as well, everyone researching their corner of the story, and then pulling from that knowledge when appropriate. So the improvisations happened in the normal Mike Leigh way that you’d improvise, and from the improvisations a very tight script would be distilled, but the difference is, we knew when we were improvising that we had to obey the known facts, that finally Sullivan agreed to write The Mikado. We couldn’t invent that they couldn’t come to an agreement about that. [Laughs.] We didn’t break any rules. We may have had a slight time-shift as to when the Japanese exhibition came to London to make it a bit neater for that part of the inspiration, but we were faithful to everything we knew that had happened, which is quite a lot. Nobody knows what they said. All the conversations they had were informed guesses, basically. But by the time we did it, it felt as if we were getting quite close to something that might have happened. I’m sure it wasn’t right, wasn’t accurate. But that’s not the point. We were making a fiction based on these known facts. JB: Well I was very reluctant to do it. I thought it was completely poor casting on Richard Eyre’s part. “That’s ridiculous. I’m too young, not right for it at all.” So I resisted it a bit, but he persuaded me that it would be all right. Obviously the script had been based on the two books that John Bayley had written, and there was an awful lot of stuff that had been written about Iris Murdoch, and had been written by Iris Murdoch. There wasn’t any film of John Bayley that I could see, but there were radio interviews. There was a program we had in England called In The Psychiatrist’s Chair, where a pop psychiatrist, Dr. Anthony Clare, would interview well-known figures about their psychological makeup. It was great stuff, and it’s sadly missed. John Bayley was one of those characters. AVC: It seems like that would be a gold mine for an actor. JB: Absolute gold mine. He had such a particular way of speaking. It was absolutely something irresistible as I was developing the character, because it at once displayed his academic intellect and his insecurity and his slight pomposity and his wit, and all coming out in the manner of his speaking, in the turn of his voice, self-deprecating but quite arrogant as well. So I spent a lot of time just getting into the voice. And facially I’m not a million miles from him. He’s a little man; I’m 6 foot, and he’s 5 foot 7, but I didn’t know that. I didn’t meet him before we did it. I met him after we’d finished the film. JB: No. Initially he wasn’t around, and then he wasn’t well, and then it became deliberate. I’d gone so far down the line I didn’t want to see him particularly. Richard Eyre I’d worked with a few times on stage and on television. But I hadn’t worked with Judi [Dench], and that was just a joy. We got on really well. It was actually a very funny job to do even though it was tragic. It was a delightful job. We had exactly the same tempo of working, of being frivolous and gossipy and naughty and irreverent until it came to when we actually had to do shooting. So it wasn’t a tortured, angst-driven experience at all, apart from the moments when we were actually focusing hard on the script. AVC: You have to save your angst. JB: Save your angst. You can’t be angsty all day or else it becomes a sort of pale angst. [Laughs.] It becomes diluted. AVC: I imagine the Harry Potter set as being like Old Home Week for British actors. JB: Sort of. Most of my stuff was with the youngsters. [Laughs.] It’s a lovely job to do. I’d worked with the director, David Yates, before, and a few of the crew I obviously knew pretty well. It was really delightful, because the kids are great, and it’s a real credit to the producers that there’s such a good, solid work ethic and enjoyment about doing it, which is a huge achievement—taking young, teenage kids and keeping them going as they grew in status and wealth into their 20s. They were all delightful, pleasant, balanced human beings, without any exceptions. Because a lot of children were involved, the hours were good, and I was working near home. It was huge fun. I really enjoyed it, and there’s a good chance you’ll bump into a load of old chums in the course of the day. AVC: You must get stopped by more 8-year-olds on the street now than before. JB: I think it’s been a sort of drip-drip in my recognition factor. One day I’ll be out and get stopped and recognized quite a lot, and you don’t know why that is. And the next day you’re fairly anonymous. I don’t know whether it’s the change of hair, or I wear a hat, or just have a different demeanor. I don’t know. It’s never a problem, never a hassle, never intrusive.